If you’ve been watching the financial news channels or reading popular magazines lately you know that the economy is on the mend towards a speedy recovery. The cover of Newsweek for April 19th states, “America’s Back! The Remarkable Tale of Our Economic Turnaround.” The stock market has bounced back nicely from its lows a year ago. Our financial institutions have come back from the brink of collapse to post huge profits. GDP has begun to increase in recent months and the economy just started adding jobs instead of losing them. Well sure technically it’s true… but why? Investment banks are making record profits (and paying out record bonuses) but that’s primarily because they can borrow money at close to 0% from the Federal Reserve and buy government debt at 4% or speculate in the stock market which is rising due to an influx of borrowed and leveraged institutional money. A large portion of the jobs that have been added are government jobs that are a burden on the productive sector of the economy including 48,000 temporary census jobs in March. People are still spending but much of that is due to government stimulus like cash for clunkers and homebuyer credits or the fact that they have some extra cash in their pocket because they quit paying the morgage on their underwater house. In short the government has been borrowing and printing money to stimulate the economy and encouraging people to borrow and spend. In reality, as a country we are in worse shape now then before the economic colapse of 2008 (and we were in lousy shape then). While things look good on the surface, our economy is based on an unsustainable system that is in its last hoorah. Before you tune me out I want to state that I am not Obama bashing (or Bush bashing for that matter.) The fact is, politicians of all stripes are responsible for our current situation and it stems back much further than the last few years of recession or the last few administrations. While men like Alan Greenspan, George Bush and Hank Paulson were saying in 2007 that the economy and our financial institutions were in great shape, men like Peter Schiff, Ron Paul and Mark Faber were sounding the alarm that we were headed for a disaster. Today, while Ben Bernanke, Barack Obama and Tim Geitner are calling the financial crisis of 2008 a “hundred year storm” that “no one could have predicted” and praising the government and Federal Reserve policies that got us out of the crisis, Schiff and company are explaining why the fundamental problems haven’t been solved and in fact have been made worse. Did the men who predicted the crash get lucky like a stopped clock that’s right twice a day? Considering that they explained why the crash was coming and detailed exactly how it was going to unfold before it happened it’s doubtful. What did they know that Bernanke and most other mainstream economists didn’t? The answer is that they were students of the Austrian School of Economics (not an actual school but a school of thought). The vast majority of economists today subscribe to Keynesian theory of economics. Why? Because that is what they were taught in business school and they accepted and perpetuated it without question. Economists and politicians love Keynesian theory because it teaches that they can steer the markets and save the economy with their wise economic central planning. It also allows them to pass out goodies to the voters. They believe that consumer spending and access to credit are what makes an economy grow. Austrian economists, on the other hand, believe that production, saving and investment is what makes an economy grow. They explain how central banking distorts signals in the market and causes the boom and bust cycle. They understand how without sound money as a restraint, governments will devalue the currency to suit their needs. They understand how bailouts, “too big to fail”, and government guarantees create a moral hazard that leads companies to reckless behavior. When John Maynard Keyenes was asked if his economic theories were sustainable in the long run he famously replied, “In the long run we’re all dead.” Well the long run is here. I am inclined to listen to the Austrian economists who have been right about the economy. They believe we are on the cusp of a major financial realignment that will seriously affect the financial and societal outlook for millions of Americans. The colapse of 2008 was just the begining. 1. To outline the severity and the immediacy of the problems facing today’s economy, what the government is likely to do to solve them, and how these “fixes” will backfire and devastate the US economy. 2. To identify some actions you can take as an individual to protect your wealth according to leading Austrian economists and to provide some resources for you to do your own research and make your own conclusions. There are several very negative macro economic factors that have been building up for years and are coalescing to cast a dark cloud over the U.S. economy. The long term structural problems include a $108 Trillion unfunded liability for Social Security, Medicare and Medicaid, a $12.8T and growing national debt, perpetual trade deficits of roughly $40B per month, a $2.5T consumer debt level, and an addiction to artificially low interest rates. Economists have been aware of these problems for decades but politicians in their perpetual quest to get re-elected have kicked the can down the road, putting bandaids on the problems to put them off past the next election cycle. As we’ve all experienced in our own personal lives, when we avoid our problems they only get worse. Unfortunately, there comes a day when the bills are due. The recent economic colapse and the actions our government has taken to “fix” the economy has made that day imminent. Our current economic circumstances including a high unemployment rate, continuing problems in the real estate market, state debts and huge state pension shortfalls, increasing taxes and regulations on businesses, and a growing deficit have put the government and the Federal Reserve between a rock and a hard place. No amount of additional stimulus or bailouts will solve the problem. The Fed is out of bullets and they must choose between two painful options- leave interest rates extremely low and risk massive inflation or raise rates and suffer a painful recession. What will our government do? It will do what all nations with serious debt problems try to do- inflate our way out of it. Unfortunately, this will have disasterous consequences for all Americans, particularly middle-class and poor Americans and people on fixed incomes, as their livelihood and life savings will be wiped out. Let’s begin with an analogy. The story of Ben, a college Freshman. He was able to get a low rate on a student loan guaranteed by the government which covered his pricey tuition. Ben’s parents were so proud of him they gave him a highschool graduation gift of $5000 to use as he saw fit. Ben goes to class and works part time as a waiter making $15 an hour and does his fair share of partying like any good college student would. He soon realizes that with his work cash and his $5000 he can live it up a little. Plus, he just got a new credit card at the student center (they were practically giving them away) so he buys a sweet furniture set for his dorm. His newly decked out room becomes a hot spot at the dorm so he throws great parties by digging into his fund to buy some booze to consume. His first credit card maxed out so he uses a second card to buy a new flatscreen TV from China to throw a Super Bowl party. To his neighbor down the hall, Ben looks like a rich guy with his act together. After all he’s got a beautiful leather couch, a 52″ flatscreen and he throws the best parties and has enough spare cash to pay for all the booze. To those of us on the outside we can see that he has squandered the nest egg his parents gave him, he is loaded up with credit card debt and has a student loan of tens of thousands of dollars to pay off. We can envision the day when his $15 an hour salary can’t pay off the credit card company and his stuff gets reposessed. From this perspective his financial situation doesn’t look so rosy. It’s easy to see that Ben was living on borrowed time but to see how our country is living on borrowed time we need to understand a very brief history of the United States. Here it is. 1. We fought a Revolutionary War and became the freest nation in the history of the world based on the rule of law, not the rule of men. 2. We became the most prosperous nation in the history of the world. 3. We got complacent and entrusted the government to take care of us. 4. We squanderd the wealth of the nation and then went into debt to maintain our lifestyle. Here’s where we are today. Tomorrow we will pay for our extravagance. To elaborate on that history a bit there are several key events in the last century that have led to the dire situation we now find ourselves in. These include wars, depressions and recession, various stockmarket scandals, etc. But the really, really big ones occured in 1913, 1935, 1965 and 1971. 1913 – was a terrible year. A double whammie. The first major event of 1913 was the creation of our current Federal Reserve Bank. America had created and abolished two other central banks before this one but the Federal Reserve, which snuck through congress during Christmas recess, has proven to be the most enduring. Its mandate was to preserve the value of the dollar and to smooth out the business cycle. Since its inception the value of the dollar has decreased by 95% and we endured the Great Depression and several recessions including our current situation. More on the ramifications of the Fed later. The second artifact from 1913 is the Federal income tax. When it was first introduced the income tax was for very rich individuals and started at 1% and maxed out at 6% with large personal exemptions. Corporations were taxed at 1%. As I type this on tax day I can only dream of what it would be like to pay a 1% income tax. The income tax has allowed our government to fight nearly perpetual war and set up a welfare state. 1935 and 1965 – Social Security was adopted in 1935. It was a well intentioned program aimed at providing assistance to the elderly as they tried to budget their savings in their final years. There may have been some foreshadowing of what was to come when the first monthly payout recipient, Ida May Fuller, who had contributed $24.75 to Social Security ended up living to 100 and received $22,889 in benefits. In 1965 Medicare and Medicaid were added to the entitlement mix (and later expanded with Bush’s prescription drug benefit). Again they were well intentioned programs aimed at helping the elderly and the poor deal with their medical expenses and again they were structured in the same flawed PAYGO Ponzi structure as Social Security. 1971 – The Bretton Woods agreement of 1944 linked world currencies to the US dollar (which at the time was convertable to gold) to stabilize international trade after WWII. In 1971 President Nixon removed all gold backing of the US dollar and the Betton Woods system broke down establishing the US dollar as the world reserve currency. This seemingly innocuous move is directly responsible for the situation America finds itself in today. Without the restaint of a hard money, the government was free to print whatever it needed to feed its voracious appetite and hide the true cost of our government. When people think of Social Security and Medicare many of them imagine a system where they pay their payroll taxes and that money goes into an account which will later fund their retirement. This is not the case. The taxes today’s workers pay into SS and MC go to pay the benefits of today’s retired workers. Any excess funds don’t go into a “lock box” but go directly into the general fund which Congress quickly spends as it pleases. The system worked fine for a while when there were six workers per retiree and people died soon after retirement. But now the baby boomers are starting to retire and they live to a ripe old age. Soon there will be two workers footing the bill for each retiree. The politicians have loved these programs because they get to give retired people (i.e. voters) handouts and they get to use the leftover revenues to fund their other pet projects without having to raise taxes. The retirees and people who got in early love it because they get great benefits. The young workers who are paying into the system now and have run the numbers to realize they won’t be getting anything back are not too happy. Just like Bernie Madoff’s early clients were thrilled with his outstanding returns while they lasted and the late arrivals got the shaft. When Madoff did it, it was called a Ponzi scheme. When the government does it it’s called a safety net. 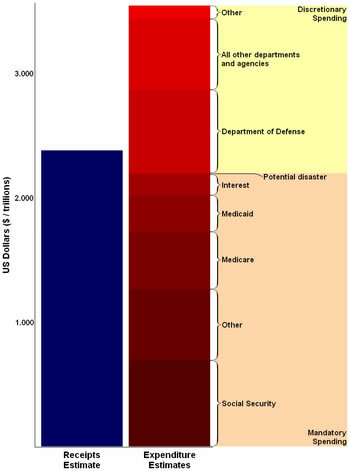 As it stands now, Social Security and Medicare have an unfunded liability of $108 Trillion dollars. That is, based on expectations of workers and retirees in the system we have promised $108T more in benefits than we expect to collect in payroll taxes over the lifetime of those workers. 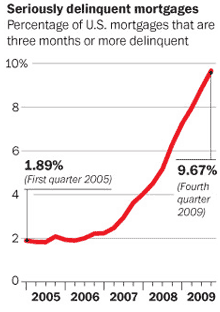 The chart below (from 2008) shows how the increasing deficits add up to $83T. It is important to note that this chart is only 2 years old and that $83T has already been revised upwards to $108T. Also important to note is that this chart assumes 0% inflation. Using an inflation multiplier the numbers would be literally “off the charts”. In the past, the system brought in more money through SS and payroll taxes than it paid out in benefits. If you imagine the above chart extending to the left you would see surpluses adding to the general fund. 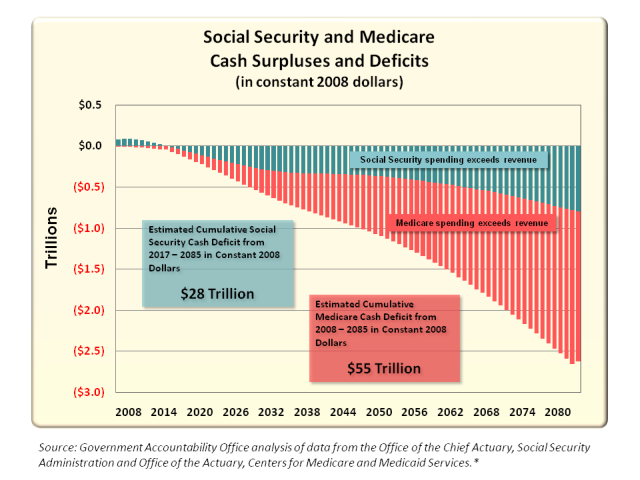 This year for the first time, Social Security will be paying out more than it collects thus adding to the deficit. And as you can see, it’s only getting worse. The documentary movie I.O.U.S.A. does an incredible job of conveying the severity of the problem through graphic charts and succinct explanations. I would highly recommend watching this movie to get a true understanding of the looming crisis of SS and Medicare. The difference between what our government spends and what it collects in tax revenue for a given year constitutes the national deficit (or national surplus if they spend less than they collect). Our government has only run surpluses in 4 of the last 30 years and the deficits are trending higher. This year’s budget deficit is around $1.2T which is quadruple Bush’s massive $300B deficit from 2007. To make up for the deficit and pay all of its bills, the government must borrow the money from American citizens, foreigners and the Federal Reserve. The sum of all of the money we have borrowed over the years which must be paid back with interest is the national debt. The National Debt is currently at $12.8T and growing. That equals $41,600 for every man, woman and child in America. That number will continue to steadily grow and is projected to be $20T by 2015. (I’ll take the over on that projection.) It’s important to note that this number doesn’t even include the massive off balance sheet debt the government has taken on in the past couple years such as the loans of Fannie Mae and Freddie Mac. Our national debt is currently about 96% of our GDP. The only time this was higher were the years surrounding WWII when we borrowed a lot of money to finance the war. The difference was that back then we had a high level of personal savings and we imediately reduced government spending to 20% of GDP. Today we have high levels of personal debt and government spending is at 45% of GDP and growing fast. As you can see from the chart to the right of the 2010 budget projection, our government is spending $1.50 for every $1.00 it takes in from taxes. To make up that difference the government needs to borrow money, mostly from foreigners. This money will be paid back eventually with interest. The problem is that we don’t have any money to pay them back with. The only way to pay them is for foreigners to loan us more money. Another problem is that the time period in which those loans become due is getting shorter and shorter. In the past, our debt consisted mostly of 10 and 30 year bonds. Today it is mostly short term debt such as 1 year T-bills or 30 day loans. That means every year a growing portion of the debt needs to be refinanced. In essence, America has one giant adjustable rate sub-prime mortgage. As foreigners come to grips with the fact that our government continues to spend beyond its means they will demand higher interest rates on their bonds to counter inflation. Currently, 7% of our total tax revenues goes just to pay interest on the national debt. If interest rates increase the percentage of our tax revenue that goes to pay interest on the debt will increase substantially. The fact is we can’t ever pay back all of our debts honestly so we will either need to default on the debts or pay them back with devalued money. Foreigners know this but they also realize that if they don’t buy our bonds we will be forced to print more money (as we have been doing) which debases our currency even further. Since countries such as China have large stockpiles of $US they don’t want that money to lose value so they have continued to buy our debt to keep the scheme going. However, they are starting to realize that our deficit spending is only accelerating and that doubling down on a losing cause is not a good bet. China, India and other countries are starting to buy less US debt and purchase other assets such as Oil, mining companies, and precious metals. They are trying to unload their dollars under the radar in a slow manner because they don’t want a rush out of the dollar. As more and more countries start to dump the dollar it could be a race to the exit which would cause massive inflation. America has been in the unique position of having the reserve currency of the world. For many years we have been able to trade our dollars for the real goods- TVs, computers, Oil, etc. As our money supply has grown Americans haven’t seen as much price inflation on goods because the dollars added to the system were soaked up by other countries who demanded dollars to facilitate trade. As foreign countries begin to seek alternatives for the US dollar as a reserve currency, those dollars will flood back to our shores and Americans will see a jump in consumer prices. How does it work? Let’s take the case of China. Americans send dollars to China to buy manufactured goods. These dollars get filtered to the companies through the Chinese government which exchanges the dollars for Yuan at a fixed or “pegged” ratio of dollars to Yuan. The Chinese in turn buy some products from the United States (often raw materials to manufacture consumer goods) but they buy far fewer goods from us than we buy from them. They also use $US to buy goods such as oil or food products from other countries and whatever is left over they stockpile. In this way they steadily accumulate $US. They have to do something with these excess dollars to get a return so the Chinese government buys US debt such as treasury bills and we have to pay them back with interest over time. Currently China alone has a stockpile of roughly $800B. The trade deficit represents wealth flowing out of our country and into other countries to the tune of $40Billion every month. Obviously, this trend cannot continue forever. As our dollars lose value it will take more of them to buy goods from foreign countries. At some point we will need to roll up our sleeves and produce real goods that other people want to buy or trade for. The problem is that in the process of exporting our dollars for goods we also exported our productive capacity. You often hear politicians blame China for purposefully debasing their currency and that it should revalue its currency to make trade more balanced. That may be so but what would happen if China was to increase the value of the Yuan by 30% as many economists are suggesting needs to happen to have balanced “fair” trade? Well, instantly a billion Chinese would have 30% more purchasing power and would be able to buy the TVs and computers they produce in their factories. And Americans would have to pay 30% more for everything they buy from China (which is pretty much everything they buy). Be careful what you wish for. 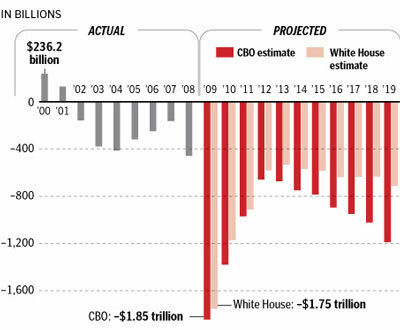 The Obama administration’s budget deficit projection for the next ten years is shown below. It’s important to note that when President Obama says he will “cut the budget deficit in half” over the next four years that doesn’t mean he is cutting our National Debt in half. It simply means the yearly spending deficit will go from the astronomical level of $1.8 Trillion to the ridiculously high level of $800 Billion. The other important thing to keep in mind is that these are merely projections based on assumptions. To give some perspective, in 2001 the government’s budget predictions for 2009-2012 called for average surpluses of $850B. This turned into deficits of $1215B or a $2T per year swing. This projection relies on the Keynesian assumption that we need to spend even more now to “prime the pump” and get the economy going again and then as the economy improves we can spend less. This is akin to a morbidly obese person saying he needs to eat this giant steak and baked potato now because it will quell his hunger so he doesn’t have to eat as much in the future and he will have more energy to begin his workout tomorrow. One assumption is that spending will go down once the economy improves because we won’t need as much stimulus. Based on the mandatory spending described above this is nearly impossible. The President has stated that the new health care plan will actually reduce the budget over the next ten years as it will cost about $900B it will save about $1T. 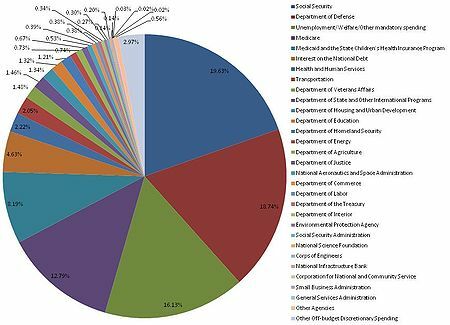 Based on the government’s track record of predicting the cost of government programs that claim is dubious. Let’s look at two such examples. By 1990 Medicare cost 10 times what the government said it would cost at that point and that gap has widened since. They also told us that the Iraq war would cost $50-$60 Billion and that it would be paid for with oil. The tally on that war is $1T and counting. What about new programs that are being considered such as cap and trade? What about unforeseen (or at least un-accounted for) spending such as a new stimulus package if the economy struggles or a bailout of state governments or a rise in interest rates which increases the interest we pay on the debt? These would all add to the deficit. We’ve been hovering around 10% unemployment for over a year. If you count people who have given up looking due to frustration and people who are working less hours or at a lower paying job than they are used to (which is how they used to count it) then we’re closer to 20% unemployment. Even more disconcerting is the steady increase in long term unemployment which is defined as 27 weeks or longer. There’s a bit of a lag time in people’s spending habits after they lose their jobs. As people are unemployed for a long time they burn through their savings, they run out of unemployment benefits and their employability diminishes. All of those unemployed will be spending less into the economy and drawing more from government assistance. Up until about 1980, Americans had high levels of personal savings. When we hit rough times we were able to dip into those reserves to tide us over. Today, the personal savings rate is $1500 per person and the personal debt (not including mortgages) is $7821 per person. When you include mortgage debt every man, woman and child holds $53,000 in debt. Not a great recipe for a rainy day. Many people think that the damage from the sub-prime mortgage crisis is behind us. In fact, we are in the eye of the storm. All of those losses from the sub-prime debacle are still there. They’ve just been moved from the books of the banks and Fannie Mae and Freddie Mac to the balance sheet of the US Treasury and Federal Reserve. But sub-prime was just the first wave. 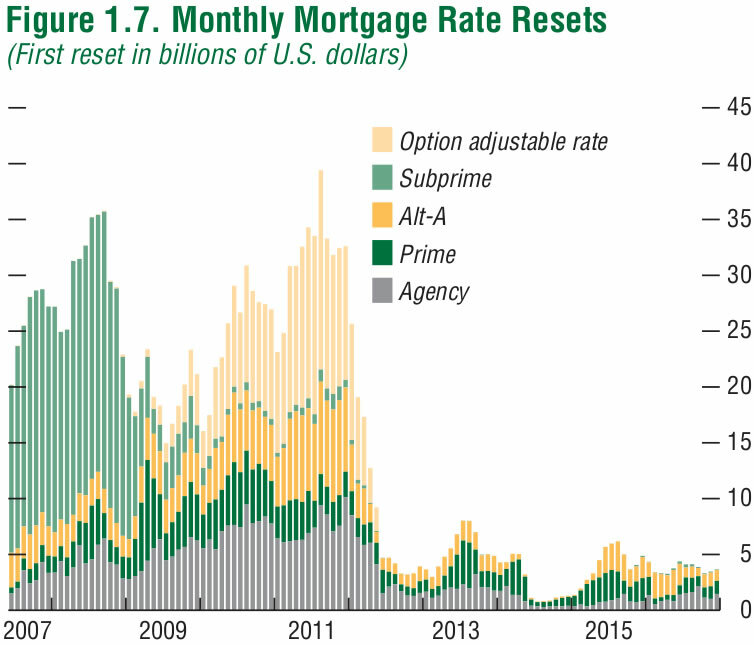 The chart above shows that the sub-prime resets are mostly behind us but a new wave of adjustable rate and Alt-A loans is just beginning. The total cumulative reset amount over the next five years is $1.6 Trillion. As bad as that chart is, it doesn’t include people who don’t face adjustable rate mortgage resets but are simply choosing to walk away from their mortgage because the property has declined in value to the point where the collateral is worth less than the mortgage. The government is trying to keep housing prices high through low interest rates, homebuyer incentives and government refinancing and guarantees. There is also a large shadow inventory of about 7 million homes that are eligible for foreclosure but have not been seized by the banks and put up for sale. This is because the banks know that if these houses were put on the market home prices would plummet. As the chart on the right shows, at the end of last year nearly 10% of mortgages were at least 3 months delinquent and rising steadily. The picture looks just as bleak for commercial real estate. Since 2007 commercial properties have seen rising vacancy rates, falling rental prices per square foot, rising mortgage delinquencies and falling property values. 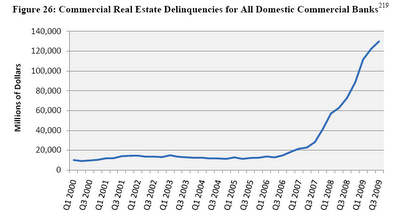 The chart below shows a clear trend in commercial loan delinquencies that will cause the failure of hundreds if not thousands of small regional banks. We’ve seen the recent problems in Greece where the economy collapsed under the weight of government deficits and massive unfunded pensions for government employees. Since Greece doesn’t have its own national currency and is on the Euro they are unable to print money to try to inflate their way out of debt. They had to beg the European Union for a bailout and implement austerity measures to control their reckless spending. The situation has caused riots and civil unrest as Greek workers demanded the pensions they felt entitled to. The likely bailout by the EU has put serious downward pressure on the euro. The interest rate on Greek bonds has risen to over 8% and climbing (wait, now it’s 16% and rising faster than I can type). Without serious reform to the Greek economy and pension system the bailout will only serve to temporarily push off the collapse. California is in a similar economic state to Greece (although not nearly as bad as a percentage of GDP). California’s budget deficit for 2010 is $20B. The current debt is $60B and including all of the debt that has been authorized but not yet borrowed the total comes to $171B. On top of that, a recent study of California’s state pension program stated, “The simulation shows that the state would need to invest more than $200 billion, and possibly as much as $350 billion, today to return the fund to a minimum responsible level of funding.” Ouch. Like Greece, California can’t print its own money to get out of the mess. Unlike Greece, Californian’s can easily move out of state to avoid increasingly high taxes needed down the road. If Germany, a sovereign state with a strong work ethic, can cave in to allow EU to bailout Greece is there any reason to believe the US Government won’t bail out California, New York and other states with serious financial problems? And California is just one of the many states with large deficit problems. In 1960 the service sector accounted for 60% of the economy with the manufacturing sector at 40%. Today the service sector is roughly 80%. Services are a vital part of the economy and many services facilitate productivity but there needs to be an appropriate balance between services and manufacturing. A high percentage of service sector jobs is an effect of a strong economy but not necessarily a cause. For one, it facilitates the trade deficit. While we can export goods to China it is hard to export haircuts, tax preparation services or childcare services. Many services are a luxury we were able to afford and have grown accustomed to as Americans. When you are rich you can afford a monthly massage or a manicure or a tutor for your kid or a personal trainer at the gym. In tough times a person might get a haircut once every six weeks instead of every four. That’s a 50% decrease in sales for the barber. It’s easy to see that many service sector jobs are expendable and will continue to put downward pressure on the economy. There was a time when America had a trade surplus. In fact this was mostly true up until around 1970. (Coincidence?) We produced the highest quality, least expensive goods and still paid the highest wages. But how is that possible? Everyone knows the reason everything gets made in China is because wages are so low. Well that’s part of it. The other part of it is that America’s government used to be tiny as a percentage of GDP and taxes and regulations on businesses were very low. It was very easy to start and operate a business, which fostered an entrepreneurial spirit and encouraged growth and investment. Over the years, taxes and regulations have grown steadily for American businesses (under both Republican and Democrat congresses) both in size and complexity and that trend looks like it will continue. It’s a bit ironic that today communist China has a more capitalist economy that the US. A thorough understanding of the nature of regulation is another topic but suffice it to say, US companies spend a great deal of time and money complying with excess regulations and red tape making them less competitive in a global economy. So what will the government do to try to solve these serious problems? What has become painfully apparent is that they won’t take the tough medicine needed to fundamentally fix the problems. The best analogy I’ve heard to describe our current situation is that our economy is like a heroin addict. We got high on low interest rates and borrowed money. It feels great while you’re taking the drug because the economy booms and everyone gets an artificial high. But eventually you start to come down and it hurts. The government solution is to give the addict more heroin, more low interest rates and more stimulus with borrowed money as it did after the dotcom and housing bubbles. The patient feels better for a while but if you do this long enough his health deteriorates and he eventually dies. The real way to cure the addict is to take away his heroin. Sure he will go through a painful withdrawal (recession) for a while and life will be miserable, but in the long run he will emerge healthier and stronger than when he was addicted to drugs. The problem is politicians can’t take away our drugs or they won’t get re-elected. Instead, they will follow the Keynesian remedy by continuing to borrow more money, stimulating the market with cheap money and direct cash payouts, bailing out large companies and states that fail, tinkering with the social security system to sweep the problem under the rug, continuing to try to prop up the housing market with guaranteed loans and purchases of bad assets, increasing regulations and taxes on business, keeping interest rates near zero and promising us more government programs to help ease the pain. 1. They can bring in more tax revenue. 2. They can borrow money. 3. They can print money. The second way to raise revenue is through borrowing. Politicians like this method because they don’t have to raise taxes which are unpopular with the voters. The problem is we can’t force people or foreign countries to lend us money; we can only entice them with a return on their investment. In the past, borrowers have accepted a low interest rate and were willing to borrow over a long period of time because they knew our government and economy were stable and could be relied on to pay them back. The deeper in debt we become in relation to our GDP and the higher our deficit grows, the more return on their investment people will demand (in the form of higher interest rates) to buy our government bonds. As interest rates increase, a larger percent of our budget will go to simply paying the interest on our massive government debt. The other problem with borrowing is that eventually we will have to pay it back when the bonds expire. Since the government doesn’t have any savings, the only way to pay it back is to roll over the loans, essentially, borrowing more money to pay the debts that come due. But what happens if people refuse to lend us more money to continue the scheme? Then we must resort to the third way of getting money. The third way, and by far the most insidious way of collecting revenue, is by printing it. This is technically borrowing too only in this case the Federal Reserve just creates money out of nothing and then the government borrows the money from the Fed (with interest) by selling US Treasuries to the Fed. (The mechanism of how this works is another topic that will blow your mind.) The government can then use this newly printed money to pay off debts, pay for wars, send people stimulus checks, or any other use they deem fit. Adding this new money to the system is inflation of the monetary base. It’s also interesting to note that the monetary base curve was fairly flat until about 1971, the year when the dollar was taken completely off of the gold standard. The recent spike at the end of the curve is the government pumping new money into the system to try to counteract the crash of 2008. You may ask, “If the government doubled the money supply why didn’t prices double as a result?” Good question. That’s because the government doubled the monetary base. 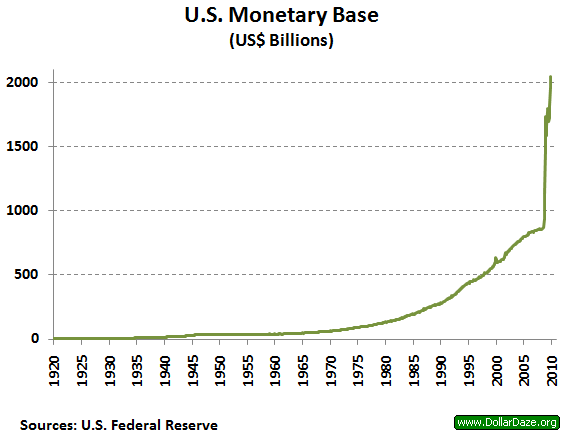 However, the monetary base is only a fraction of the total supply of money. In our fractional reserve banking system the big money creation is done by the banks. In short, for every dollar that the Federal Reserve Bank creates, commercial banks can create up to around ten times that much by lending out ten times as much money as they hold in reserves. (This is a topic all to itself.) During a recession, banks don’t lend out as much money because they require higher lending standards to make sure they don’t lose their investment and fewer people are willing to borrow in a bad economy. A better question to ask would be, “Since we have high unemployment and banks aren’t lending out money why haven’t consumer prices fallen?” Good question, that’s because the Fed has increased the monetary base by so much that it has counteracted the decrease in money supply due to tightened lending. Plus in a global economy the price of many goods are driven by global demand. But then you might ask, “Well what happens when the government continues to print more money to pay its skyrocketing bills and the banks start lending money?” That’s when we get the serious inflation. But why is inflation so bad? We’ve been conditioned to see a reasonable level of inflation as normal. We think nothing of it if prices rise a little bit each year because our salaries tend to increase and it all works itself out. There are three main problems with inflation. First, inflation is a stealth tax which dispro-portionately hurts the poor, middle class and the elderly. When government inflates the money supply, the banks and government get to use the money before prices have adjusted to the increase in money. It takes a while for that extra money to filter down to the common person and when they finally do get it in the form of increased wages they have already been paying higher prices for everything they buy. People on fixed incomes see their purchasing power decrease each year. If you couple inflation with low interest rates it means that people who try to save their money in a savings account or bonds lose out in the long run because inflation trumps the small interest payments they receive. This forces everyone to become a speculator in the stock market investing in things they may not understand in search of a return that beats inflation. Second, high inflation adds uncertainty to the market and makes it difficult for businesses to make long term deals. It’s hard to contract to pay someone a certain price in the future when you don’t know what the money will be worth in a year. But the third and scariest aspect of inflation is that once a government starts relying on inflation to reduce its debt load, it begins a self-perpetuating cycle that is very hard to break without severe damage to the economy. In the late 1970s, then Fed Chairman, Paul Volker, had to raise interest rates to nearly 20% to stave off inflation. Can you imagine what would happen to adjustable rate mortgages or the cost of our borrowing from other nations if the Fed Funds rate reached that high today? Our economy would implode. Instead it is more likely that we will succumb to the inflationary spiral and in the process wipe out the purchasing power and life savings of millions of Americans. If we’re not careful, we could follow in the footsteps of post WWI Germany or Argentina or most recently Zimbabwe. A billionaire in Zimbabwe can’t even buy a pack of gum. In today’s vernacular, inflation has come to mean a rise in consumer prices. Austrian economists consider inflation to be an increase in the money supply and view rising prices as a consequence of inflation. In any case, stuff gets more expensive. The chart below of the Consumer Price Index is very informative about the nature of money and inflation. Before 1971 US currency was directly linked to gold. As the graph shows, with the exception of a spike in prices during wartime, the natural tendency in a free market is for prices to gradually fall. This is because as technology and productivity increases, it becomes less expensive to produce goods. We’ve all seen this to be true with televisions and computers but the same is true for farming or construction (and even education and health care believe it or not). With the creation of the Fed in 1913 the central bank was able to manipulate interest rates to increase the money supply and subsequently the CPI. As the graph shows, once the dollar was decoupled from gold in 1971 consumer prices have risen at a steady rate despite the astounding technological advances in productivity such as the personal computer and the internet. If you watch the financial news you may hear that the price of gold has risen or fallen on a particular day. Austrian economists would point out that this isn’t the proper way to view the situation. Imagine yourself dropping a rock off of a tall building. From your perspective you would say the rock is falling. To a bug sitting on the rock, it would appear that you are rising. As Einstein said it’s all relative. In reality, the dollar is falling like a rock and gold is simply maintaining its value. 3000 years ago an ounce of gold could buy you a nice toga, and a pair of sandals. Today an ounce of gold can buy you a nice suit, and a pair of shoes. Over the course of civilization the purchasing power of gold has remained roughly the same. Conversely, the Dollar has lost roughly 95% of its value since the Federal Reserve was created in 1913. That’s not to say that gold doesn’t fluctuate as speculators bid up the price or as gold loses favor as an investment. But over time the value of gold remains fairly constant while the value of paper fiat currencies decline until they reach their intrinsic value of zero. In the last 10 years the price of gold has risen by over 400% which gives a good indication of the inflation we have already seen and a hint of what’s to come. What can an Individual do to Preserve Wealth? Austrian economists and big picture thinkers in general have a lot to say about what the government should do to fundamentally fix the economy and how we can achieve sustainable prosperity. However, that is not the point of this paper. The point of this paper is simply: Given the state of the economy and the course of action our government is likely to take, what can an individual do to preserve and grow his or her life savings and not be wiped out by increasing inflation. I am not a financial planner or a stock analyst or a trained economist and I would certainly not presume to tell anyone how to run their personal finances. That being said, I have spent a lot of time over the past three years learning about the nature of our monetary and banking system and the theories of Austrian economics. The Austrian perspective is rarely discussed in schools or the main stream media and consequently most people aren’t even aware it exists. While (almost) everyone is interested in money and would like to have a little more of it, most people find the topics of money creation and Austrian economics too esoteric or boring to bother thinking about them. I have grown very concerned that this lack of interest and understanding of the economic forces in today’s world will cause many Americans to lose much of their life savings. I was inspired to write this paper because I don’t want my friends to suffer that fate. On the flip side, as with any large shift in wealth, many people will see a substantial increase in wealth if they are able to correctly analyze the trends. And again, while I don’t want to tell you what to do with your money, I will tell you what the people who were consistently right about the economy and political trends in the past have been saying about investing, wealth preservation and today’s economy. People like Peter Schiff, Jim Rogers, Mark Faber, David Walker, Robert Kiyosaki, Gerald Celente and Ron Paul among others. I’m hoping this paper will pique your interest so you can do your own research, draw your own conclusions and apply that knowledge to your own personal situation. Debt is an often misunderstood mechanism. Many people consider indebtedness to be a bad thing no matter what. But that is not always the case. There is good debt and there is bad debt. If a cabinetmaker takes out a loan to buy a power saw it will greatly increase his productivity compared to the hand saw he currently uses. Instead of toiling away cutting boards by hand and slowly saving enough money to buy the power saw, he will be able to build cabinets at a much faster rate starting today and the additional sales he can generate will more than make up for the interest he pays on the loan. This is good debt. It was a capital investment to improve his productivity and the loan paid for itself. In contrast, if a person takes out a loan to buy a luxury car instead of one he can afford, he has assumed bad debt. He would have been better off saving and investing for a few years while driving a cheaper car until he could afford the luxury car without having to pay interest payments to a banker. Bad debt is a surefire way to financial ruin. If you find yourself financing your consumer spending with revolving credit card debt at a high interest rate follow these simple steps. Step 1- slap yourself in the face. Step 2- cancel your cable subscription, sell your unused stuff and don’t buy another pair of jeans or a glass of wine in a restaurant until you can pay off all of your cards. The artificially low interest rates our Federal Reserve has created is beneficial to debtors at the expense of savers. In an inflationary environment, long term fixed rate debt can be a good thing. If you can borrow for thirty years at 5% and the inflation over that time is 10% you will be earning 5% a year. Conversely, adjustable rate debt is disastrous in this environment as interest rates will be forced to rise as they did in the 1970s. If you own a home with an adjustable rate mortgage you should seriously consider refinancing to a fixed rate or getting out altogether. Similarly, governments can have good (or at least necessary evil) debt and bad debt. In the early days of our country, the colonial government took out loans from foreign nations to finance the Revolutionary War. Without those loans we would have not have been able to buy the supplies and munitions to win the war and many Americans would have died in vain and those who didn’t would have suffered punishment for their insurrection against the British. Once the war was over we worked hard as a nation to pay back those necessary debts and paid off the entire national debt by 1840. Today, whether you like it or not, your government has run up $41,700 worth of bad debt in your name. And you and your children will pay it back through higher taxes and a loss of purchasing power through high inflation. The people who keep all of their savings in US dollars will end up paying the biggest share of this debt burden. The people who protect themselves against inflation will manage to preserve their wealth. In the last century, diversification meant that you should invest in US stocks and US bonds. If you invested across different stock market sectors and hedged with government bonds you were pretty sure to get a good return on your investments with minimal risk in the long run. The difference in today’s economy, aside from the anti-business headwinds discussed earlier in this paper, is that there is a significant currency risk in holding $US assets. That’s not to say that the US stock market won’t go up in nominal terms. The stock market could crash due to toxic balance sheets and declining revenues or it could continue to go up due to the Fed pumping new money into the system. It’s anybody’s guess. If high inflation kicks in stocks will rise in terms of dollars but they won’t be able to keep up with inflation, and they are certain to fall in terms of gold (the measuring stick). Remember, your stock holdings could double but if the price of the things you buy triples, you are worse off. In the past, emerging markets and foreign exchanges were very risky due to unstable political situations and the immaturity of those markets. Only well connected and savvy investors could get into those markets and properly evaluate risk. Today, many of those markets are much more stable and the countries are much sounder financially than the US. Also, there are better valuations and higher dividend payouts to be found in emerging markets. As a point of reference, the Hong Kong stock exchange has nearly doubled the returns of the DJIA since 1990. As famed investor Jim Rodgers put it, “If you invested in Great Brittain in 1800 you would have done very well. If you invested in the United States in 1900 you would have done very well. I believe if you invest in Asia in 2000 you will do very well.” His point is that the wealth of the world flows to nations that establish an environment of productivity and sustainable growth. In today’s economy, countries who thrive at production like China and countries rich in natural resources like Australia, Canada and Brazil will do well in an environment where central banks around the world are inflating their currencies. The mantra of mainstream economists and investors has been that American consumption is the driver of the global economy. You may have heard the phrase, “when America sneezes the world catches a cold.” They believe that if American consumers stop spending, the Chinese economy will crash because there will be no one to buy their products. Nothing could be further from the truth. While China has its own particular problems this is not one of them. There are a billion Chinese who demand consumer goods. They are just priced out of the market right now because their government has been propping up our currency. As the Chinese government stops subsidizing the US, the standard of living for the Chinese citizens will rise as they will be able to buy the goods they produce in their own factories. That is, buy real tangible things. Western economies are in a race to devalue their currencies to make their exports more attractive. Printing more dollars doesn’t make a country wealthy. If it did we could just print a gazillion dollars and be rich. All it does is make the real goods that people need and want more expensive. In this environment, real goods will preserve their value while currencies will diminish in value. Commodities (including precious metals) conform to the laws of supply and demand. As countries like China and India become wealthier a billion people will be brought out of poverty. Those people will seek an American lifestyle which includes more products, bigger houses, more energy use, and more food. Supply of those commodities will increase but it will be hard pressed to keep up with demand in an environment where it is difficult to get a loan to invest in capital projects and a world with increasing land and water use problems. More and more people will be competing with Americans for limited resources so prices will naturally rise. The other half of the supply/demand equation is the supply of dollars. If the supply rises due to government printing the demand for dollars and thus their purchasing power will shrink. It will take more dollars to buy the same amount of oil, corn or steel. Let’s take the case of gold as the most widely used precious metal. To be clear, Gold is not really an investment. More accurately gold is money that maintains its purchasing power and thus serves as a hedge against inflation of currencies. Many investors see “gold bugs” or people who like to invest in gold as foolish investors because over the long run stocks have outperformed gold. If you start in 1980 when gold reached a peak, the stock market has significantly outperformed gold. But what is the right timeframe to start the comparison? I would submit that it is 1971, the year the dollar was completely broken from its ties to gold. 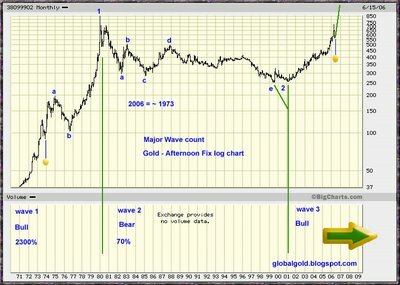 The chart below shows the price ($US) of gold since 1971. In that 40 year time span gold has generated a return of 9% per year. Over that same period the Dow Jones average has returned 6.6% per year (not including stock dividends which if reinvested would add about 3.3% per year for a total return of about 10%) and the consumer price index, CPI, has gone up 4.3% per year. This demonstrates that owning gold not only outpaces inflation but also closely matches the stock market over the last 40 years. Over the last 10 years when gold started its current bull market it has destroyed stocks as an investment. The price of gold has gone from $250/oz to $1150/oz, a 460% return. The stock market has actually lost value over that period. This corresponds to the timeframe when the government really began ramping up its deficit spending and keeping the interest rate ridiculously low to avoid a recession after the dot com bubble. So is gold simply in a bubble? 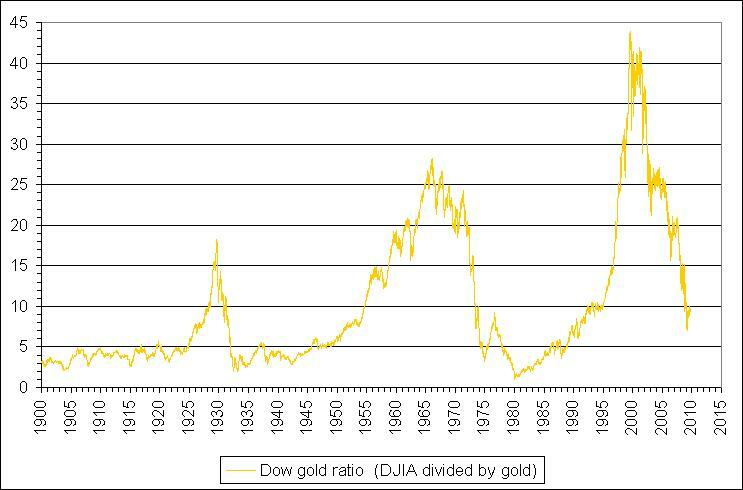 The chart below shows the historic ratio of the price of gold to the price of the Dow. The last time America faced high inflation in the 70s the ratio of the DJIA to Gold dropped to 1. As the chart shows, during the dotcom bubble the stock market got bid way up in terms of gold to peak around 43. The ratio currently stands at 10 which means if the ratio were to get to same level as 1980, gold will outperform the stock market by ten times. Many Austrian economists believe the conditions are more bullish for gold today than in the 70s. The dollar is currently the reserve currency of the world. But as the dollar and other paper currencies continue to weaken, many countries like China, Russia, Saudi Arabia and India are beginning to accumulate gold reserves. If gold were to regain its status as a monetary metal and de facto reserve currency, the price of gold would go through the roof. 1. It is a precious metal that has been used throughout history as money but it’s also a valuable industial metal that is essential in circuit boards, water and air purification, anti-bacterial applications and more..
2. The historical gold to silver price relation is between 16 and 30 and today it’s trading at 64 oz of silver to 1 oz of gold. Above ground supply of silver is only 9 times that of gold and falling fast due to reason 3 below. 3. The demand for silver has outpaced the production of silver every year for the past 20 years so above ground stock piles are being depleted. Once silver is used in a circuit board or camera it is nearly impossible to recover. Anyone can easily accumulate silver. A one oz coin sells for about $20. Got silver? There are many ways to own precious metals. You can buy coins or bullion to store at home or pay a small fee to store at a storage facility. You can buy exchange traded funds which trade like stocks such as GLD or SLV. However, you are trusting that these funds have the actual gold or silver they claim to have. You can also buy mining stocks but this requires some knowledge of the individual company just as investing in any stock. When times are tough, families (and governments) need to pare down and focus on the essentials. Our grandparents and great grandparents who lived through the great depression know this lesson all too well. When I was in college my grandmother used to mail me rebate checks for $1.25. Surely she knew it wouldn’t buy much, but the sense of frugality and discipline she developed during the hard times stayed with her throughout her life. Focus on the things you can control- your health, your attitude, your relationships, your work ethic and spending habits. Prepare for a rising level of civil unrest. America is a resilient country with a well established legal and societal system but that doesn’t mean there won’t be problems if the economy worsens. Throughout the world when economic conditions get really bad, people get angry and crime rates go up. As trends forecaster Gerald Celente says, “When people lose everything and have nothing left to lose, they lose it.” In a high inflation environment we could see price controls like we had in the ‘70s which could lead to shortages and long lines. Keep essential supplies on hand in your house. And have a plan of action for what to do in an emergency. Prepare and be aware of what governments may do. If the dollar does collapse as a reserve currency it will be replaced by something. Will it be a gold standard, a basket of currencies, a super-nation currency created by the IMF? A worldwide fiat currency would be disastrous as people would have nowhere to turn and the bankers would end up with all the money. When economic crises occur, governments tend to seize more power and take away more rights of the people. Hitler came to power in the vacuum created by the hyper inflation of the Weimar Republic in Germany. Americans need to inform themselves of history and current events so they can recognize when their freedoms and money are being taken in the name of safety or national security or economic stability. I realize some of these predictions for the economy seem dire but once you understand them, the future is a lot less scary. Armed with this knowledge we can protect ourselves, but many Americans will be hurting in the years to come. You may find yourself living like a rich tourist in a poor country. So, if you can afford it, tip well, give freely, and buy local. And remember, the best things in life are free. Well that’s my summary of the economy. I hope you found it interesting and will take some time to do your own research and learn as much as you can about money, the economy and personal finance. Even if you think I’m totally off base maybe you will devote 5% or 10% of your investments to these ideas “just in case.” I’m happy to try to answer any questions you may have. This entry was posted in Economy, Investing and tagged federal reserve, gold, inflation, silver. Bookmark the permalink. I was interested to read your article, but I stopped at the point of your logical fallacy where you claimed one difference between Austrians and Keynesians was that Austrians don’t believe in bailouts, “too big to fail”, and government guarantees. Those things don’t exist in Keynesian economics, and if you don’t understand that much, what’s the point in reading the rest of your article?